Hmmm…apparently you can’t use strike-through in a title! I wanted to title this post Meet Me in St. Louis Sonoma! Oh well. But really. Come meet me in Sonoma next week! Matt and I will be attending several events and if you’d like to come, I’d love to meet you. First, on April 14, Patrick kindly scheduled a Happy Hour for Healdsburg area folks at the Healdsburg Bar and Grill from 4-6. We’ve got a good group of people signed up so far, but would love to have a bigger crowd! You can get all the details here. RSVP now and come enjoy some happy hour specials! 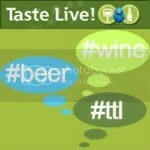 And then, on April 17, the biggest live internet tasting of wines ever for Twitter Taste Live!! Wine Bloggers, retailers, and TTL have partnered with Hospice du Rhone to taste Rhone varietals in 3 different time zones. On the West Coast, Estate in Sonoma is hosting a food and wine event for all who want to participate. From 7-10, for $12, enjoy food from The Girl and the Fig! 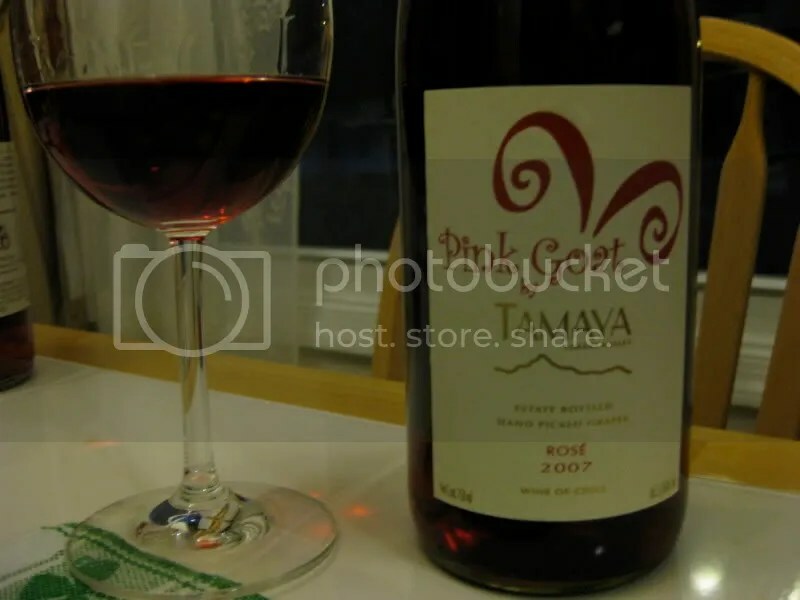 Bring a bottle of a Rhone varietal to share and join in the fun. Patrick, Thea, Shana, Matt, and I will be there! Details here. *Disclaimer: I received this wine as a sample from the PR folks for Wines of Chile. Egads, goats! A Rosé sounded like the perfect wine the other night…as it has for about the last week or so and looks to stay in my good graces for the next oh….8ish months as we enter into the blisteringly humid summers the swamp called DC is famous for! 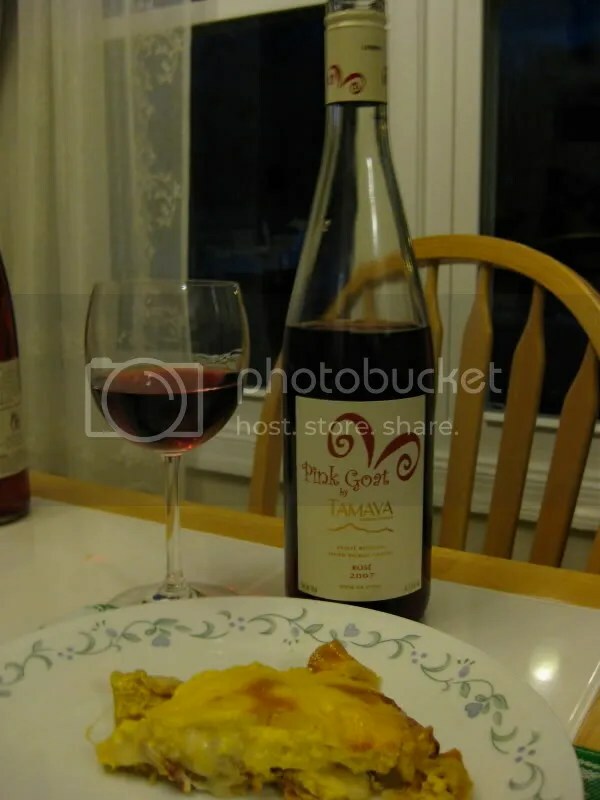 I picked the 2007 Pink Goat Rose by Tamaya to eat with our homemade quiche the other night. The Goat clocked in at 13.5% alcohol by volume, had a real cork closure, is a blend of Syrah, Cabernet Sauvignon, and Sangiovese, and I have no idea what it retails for, there’s no info on the internet about it! Matt made an amazing quiche for dinner, bacon and gruyere, yum! I thought a Rosé would be a great idea to go with the eggs and I hit that pairing out of the park. The easy drinking, dry Pink Goat went fabulously with the quiche. On the nose I found lime, raspberry, strawberry, orange rind, candied cherry, and flowers. In the mouth I got flavors of strawberry, cherry candy, lime, raspberries, and orange blossoms. Overall, I found the Pink Goat to be dry and refreshing and very easy to drink. Filed under: Chile, Rose, Wine |	Comments Off on Pink! Goats! Pink Goats!